The Sermon on the Mount in Matthew 5 - 7 may be the single most influential religious text in all of recorded history. It defines the essence of Christianity for multitudes past and present. The fact that a very similar sermon appears in 3 Nephi 11 - 18 has provided fodder for critics of the Book of Mormon who contend that Joseph Smith simply lifted this iconic text from the King James Bible. Upon close examination it is now clear both the Matthew and 3 Nephi versions have significant dependencies on much earlier temple texts. Two key players in this unfolding exegetical drama are Margaret Barker who read theology at Cambridge and John W. (Jack) Welch who read Greek philosophy at Oxford. Dr. Barker, an English Methodist preacher, is widely recognized as the founder of Temple Theology, a branch of inquiry within Biblical (primarily Old Testament) Studies.She was elected President of the Society for Old Testament Study (SOTS) in 1998 and edited the Society's second monograph series published by Ashgate. Barker is the author of 16 books. She was awarded the Doctor of Divinity degree in 2008 by the Archbishop of Canterbury "in recognition of her work on the Jerusalem Temple and the origins of Christian Liturgy, which has made a significantly new contribution to our understanding of the New Testament and opened up important new fields for resrearch." In 2008 she and others founded the Temple Studies Group which believes the Temple in Jerusalem had a formative influence on the development of Christianity. (One is reminded of Hugh W. Nibley's 1959 Jewish Quarterly Review article "Christian Envy of the Temple" published in Mormonism and Early Christianity, vol. 4 in The Collected Works of Hugh Nibley (Salt Lake City: Deseret Book and FARMS, 1987). The North American Academy for Temple Studies headquartered at Utah State University spun off from the UK-based Temple Studies Group. Jack Welch, Philip Barlow and Gary N. Anderson form the Academy for Temple Studies executive committee. For some intriguing Book of Mormon connections with ancient Temple lore, see the blog article "Temple Conference 2013." Welch, Robert K. Thomas Professor of Law at the J. Reuben Clark Law School, BYU and Editor-in-Chief, BYU Studies, formed the Foundation for Ancient Research and Mormon Studies (FARMS, now the Neal A. Maxwell Institute for Religious Scholarship, BYU) in 1979. Jack studied history, philosophy, Latin and Greek at BYU, Greek philosophy at Oxford (St. Edmund Hall), then law at Duke where he edited the Law Journal. While at Duke, Welch studied with James H. Charlesworth, now George L. Collord Professor of New Testament Language and Literature at Princeton Theological Seminary. Welch is a member of the steering committee of the BYU New Testament Commentary. 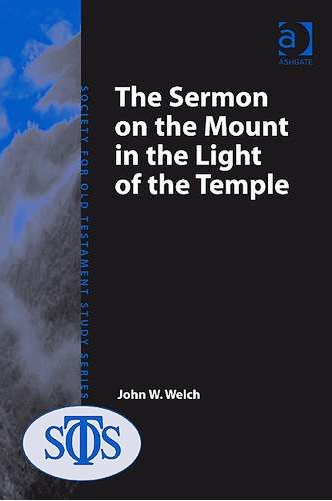 Welch's book Illuminating the Sermon at the Temple & Sermon on the Mount: An Approach to 3 Nephi 11-18 and Matthew 5-7 (Provo: Neal A. Maxwell Institute for Religious Scholarship, 1998) broke new ground as it compared the two texts and found many concepts, phrases and symbols clearly derived from earlier temple literature. Margaret Barker has long been popular among LDS scholars because her Temple Theology bridges the Old and New Testament worlds just as the Book of Mormon and contemporary Mormonism do. Many Christian thinkers like to see the New Testament as a completely new and revolutionary worldview. Barker and most Jewish scholars view the New Testament as a late expression of pre-existing ideas, traditions, customs and symbolism from an earlier era. The Book of Mormon fits comfortably in the Barker - Jewish camp. Barker liked Welch's book and appreciated how beautifully the Book of Mormon elucidates and expands upon the Bible while dovetailing seamlessly with it. (For an Evangelical turned Catholic articulation of the same idea, see the blog article "Mormon Christianity" which discusses the work of Stephen H. Webb). This idea of Book of Mormon as extension of and reinforcement to the Bible is expressed powerfully in 1 Nephi 13 and 2 Nephi 29. Barker asked Welch to do another treatment of his Sermon on the Mount material minus the Book of Mormon content for mainstream Old Testament scholars. At first Welch was hesitant. Leaving out the Nephite text would handicap him. After all, it was 3 Nephi that clarified many of the Old Testament - New Testament relationships in the first place. As he got into the project, though, Jack discovered rich new veins of material to work with in the Psalms as well as post-exilic Old Testament sources. In his 1998 analysis, he had limited his use of the Old Testament to texts that would have been on the brass plates of Laban spirited out of Jerusalem ca. 600 B.C. 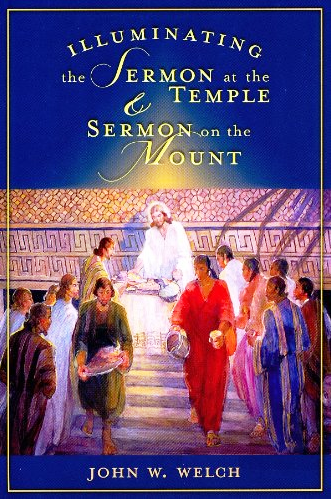 In 2009 Welch's The Sermon on the Mount in the Light of the Temple appeared in the Society for Old Testament Study Monograph Series edited by Margaret Barker and published by Ashgate. The Book of Mormon only appears once in this work, at the end of the final chapter as another example of the Sermon on the Mount in a Temple setting. Welch's use of the terms 'illuminating' in 1998 and 'light' in 2009 are not coincidental. Temple liturgy as revealed by the Prophet Joseph in this the Dispensation of the Fullness of Times Ephesians 1:10, Doctrine & Covenants 128:18, etc. is a restoration of Temple worship in Old Testament times and the Temple clarifies and brightens our understanding of Matthew 5 - 7. Matthew, of course, was the Gospel writer who specifically targeted a Jewish audience. When Jack discovered chiasmus in the Book of Mormon on August 16, 1967 in Regensburg, Germany, the voice that startled him said "if it is evidence of Hebrew style in the Bible (referring specifically to the Book of Matthew), it must be evidence of Hebrew style in the Book of Mormon." John W. Welch, "The Discovery of Chiasmus in the Book of Mormon: Forty Years Later" in Journal of Book of Mormon Studies 16/2 (2007). A PDF of the article is available here. As Neal Rappleye deftly observed in Welch's office on Friday, December 19, 2014 these two John W. Welch books are a formidable vindication of 1 Nephi 13:40. A work of Book of Mormon scholarship led directly to significant Biblical scholarship. We now understand the Bible better because of insights gleaned from the Book of Mormon.